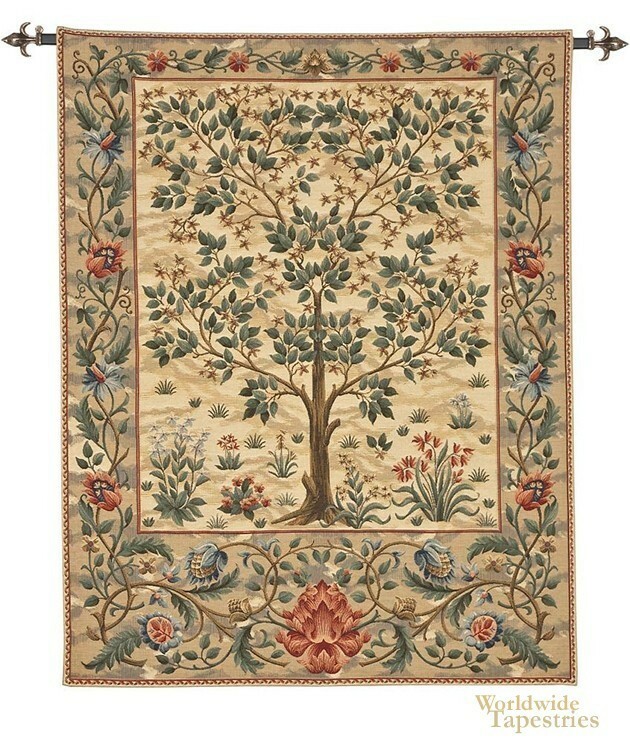 This stunning tapestry of the Tree of Life is inspired by the design of Morris and Co from the 19th century. Here we see the gorgeous tree design by William Morris (1834-1896) and John Henry Dearle (1860-1932), from around 1910, which was also known as the Garden. The detail in this tapestry is impressive and shows the immortal tree in a light background and an ornate border to show leaf vines and red flowers to compliment the scene well. The tree is one of Morris’ most famous designs and represents the life force of nature and immortality of life, depending on the interpretation. The blue green and yellow acorn like flowers as well as the burnt sienna red flowers add a sophistication to this exclusive work. Note: tapestry rods and tassels, where pictured are purchased separately.